Special Terms of this item. We no longer have any of these parts. If you have any of these items on a futon frame that you no longer need, we will buy them from you, or you can send them to us so that others that need this part do not have to throw it away, and buy a new frame. Please contact us by email for more information. Thank you, The Fantasy Futons Team. 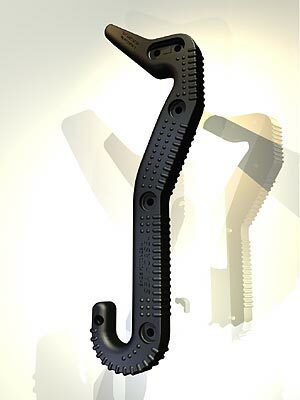 Futon Arm Track (Each) - This is a very specialized part. Nothing else looks like it. They are attached to the left and right side, or arms of the frame. The back deck of the futon slides in this track and allows the futon to convert to a sofa and to a bed. It is the only part that looks like this so we didn't list the dimensions. If what you need looks like this piece, this is it. They are different for the Right Side Sitting or Left Side Sitting side, so make sure you order the correct one. If you need the bolts to install this part you will have to ask for them specifically.